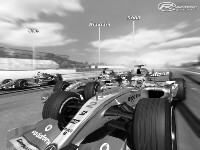 The MAK-Corp F1 2007 Mod for rFactor brings players the entire grid of the 2007 FIA Formula 1 World Championship. Featuring all eleven teams and twenty-two drivers, the F1 2007 Mod will allow you to pit your simulation racing skills against the very best drivers in the world racing scene. The mod features optimized vehicles for each team providing unique physics and engine performances to simulate the real life performances these cars have. Take to the wheel of a 2007 Formula One car and see if you have what it takes to mix it with the big boys. Credit for the fix goes to newly appointed MAK-Corp CAMs Editor Oliver Kwoka and to Ashley Webster for the idea on the fix method. 11 Teams & 22 Drivers from the 2007 FIA Formula One World Championship. Unique physics for each individual team. Unique engine sounds for each engine supplier. Public & Server Editions in one install. We recommend changing your two settings in your PLR for better AI experience. The 3D Vehicle Models, 3D Helmet Models, 3D Driver Body Models, all 2D Textures, Sound Files, Physics and other elements of this mod created by MAK-Corp are proprietary property of MAK-Corp. All rights are reserved. No content from this mod must be used without express prior written permission. All other elements in this mod that are used for the mod to run such as the rFactor game title remain intellectual property of their respective owners. Beta Testers: We would like to thank all the beta testers who were involved in making this mod possible. As the defined list has been lost over the years, we would like to thank all those involved and you will know who you are. F1, Formula 1, the Formula 1 team names and liveries are all property of their respective owners. MAK-Corp does not have any affiliation with the FIA or the FOM and this mod is created for free as a free add on to be enjoyed by those who love the sport. Please respect the rules and regulations governed by the FIA and FOM and do not use any of their trademarks for commercial purposes without express prior consent from them. they could last for months because of the reduced temperatures	source	the chamber vacuum cleaner dealers are worth investing on. 3d arms don't work on all cars, like the red bull. Can someone fix this? Just joined and not really sure what I can download or not. I have Rfactor Special Edition 2008. Can I download these mod for free or do I have to pay or have a Pro account? v3.0.2 is out of this mod and v3.0.3 will be out soon so be sure to check MAK-Corp's website for all support and info. I guess this mod has the same? Then just increase those figures for less sc appearances no? For the love of god can someone PLEASE tell me how to disable the goddamned safety car?! I'm sick and tired of having my races ruined because the idiotic car turns up somewhere on the greens or in a river or some such nonsense instead of on the track. Any chance to see all the liveries and shape updates for the teams in v3? Or it will remain like early and end season? I think it would be great to have the car exactly as it was raced for each track in terms of look (livery), shape (chassis upgrade) and even a car setting for the track. Maybe I dream too much but I think that would make it as close as possible to an enjoyable professional simulator experience. The release of v3 is expected to be this summer or there is still work to do and even more patience is in order? Thanks for a great 2007 F1 simulator!! !